The Philadelphia branch of the Jewish Labor Committee (JLC) presented its Labor Human Rights Award to labor attorney Bernard Katz, at a reception held At the UNITE! Building, 22 South 22nd Street, on Thursday, December 13, 2007. Seth Goldstein, President of the Philadelphia JLC, opened the program, stating that "the great attendance that we have tonight the vibrancy of the progressive Jewish community and our friends." Rosalind Spiegel, area director of the JLC in Philadelphia, added, "I am very pleased to be here to honor and celebrate the accomplishments of Bernard Katz and the Jewish Labor Committee, which could not do its work without its friends, our friends of friends, and our board members." A nation where all of us have a seat at the table and none of us are trapped on the outside looking in. That vision has sustained JLC for decades. Our winning strategy promotes the shared values of organized labor, and a compassionate Jewish community. The strategy is as sound as ever. JLC has been, and remains, a powerful link between a Jewish community who celebrate our liberation from Egyptian slavery, and a Labor community which celebrates our modern struggles for recognition and workplace justice. Spiegel added that JLC continues to work for passage of the Employees’ Free Choice Act, so that workers would be free to join unions without employer interference, for the passage of health care reform in Pennsylvania, and for combating anti-Semitism and other forms of bigotry. Lynne Fox, general manger of the UNITE/HERE Joint Board of Philadelphia and an International Vice-President of the union, recalled how Katz mentored her as a Labor attorney; "We were together for quite a long time," she recalled, "and Bernie taught me everything I wanted to know about Labor Law, but was afraid to ask. He was a great teacher, and he taught me about Labor unions, too. He was the only man not related to me or the other women who could call them ‘sweetie,’ ‘honey,’ and ‘darling,’ and it wouldn’t be offensive." Bruce Hummel, Business Agent for Chocolate Workers Local 464, BCTGM, recalled how Katz assisted his union in a dispute with the Hershey chocolate company. Many of his members wanted to call Katz "Saint Bernard." "The reason why," said Hummel, "is because of the dogfight that he has in him, to chew on management’s pants cuffs, until justice and dignity prevail for Hershey’s workers and elsewhere. He taught me that, to fight. He taught all the leaders (of the union) that it’s very important to represent, in a professional way, your members." Upon receiving the award, Katz said, "I’m happy to have the occasion of being here, and being able to think back to hear some of my buddies, and to review some of what happened before." Katz spoke of a "disease that seems to have afflicted the Philadelphia City Council" for the past couple of days; "I’m not sure what it is," he said, "but it is a dangerous disease, and as best as I can figure it out, there are some union busting people who do not like the standards that the Building Trades Council and its affiliated unions have established for workers." Anti-union members of the council, he added, "have decided upon indirect methods of attempting to weaken the fabric what of labor management relations, and the Building Trades Council, and unionized construction is all about." Katz said he was "troubled, troubled, troubled," by what he heard from City Council, which recently discussed legislation that would allow nonunion workers to take part in expansion work for the Pennsylvania Convention Center. "Some either thoughtless, dull-witted, or vague people in City Council are doing it in order to create a profit making change for construction employers, to allow them to ultimately charge prices at their whim, but in so doing, not to be hampered by decent wages, hours, and working conditions that a unionized segment of this geographic area can assure." Katz urged those in attendance to "look out, there is something going on. City Council is not being pushed by a group of firm beliefs of right and wrong, somebody is manipulating something, who predetermined that there should be a spread of ‘union-busting,’ and non-union working conditions and non-union wages and hours." Speaking about the national political scene and the elections of 2008, Katz said, "The National Labor Relations Board has become our enemy, by a three to two count." Three members of the NLRB were appointed by "that glowing genius in the White House," and these three have voted against unions in collective-bargaining agreements. 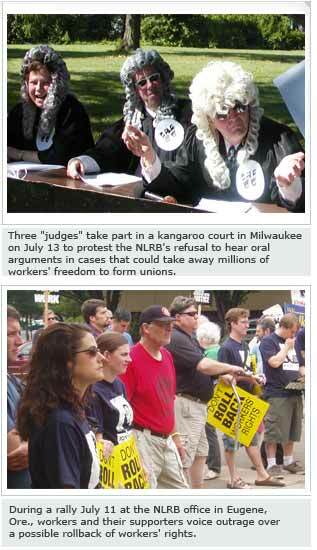 In the 2008 election, added Katz, "We will have a President who determines who these three people in the NLRB are going to be."